The dive site Kalk Bay Harbour Wall is a shoreline rocky reef and artificial structure in the Kalk Bay area on the False Bay coast of the Cape Peninsula, part of Cape Town in the Western Cape province of South Africa. 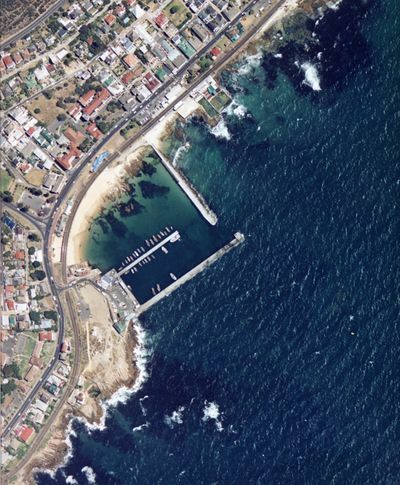 Aerial view showing Kalk Bay Harbour Wall dive site. (Photo CDS&M). The site is mostly used for commercial diver training and collecting lead sinkers and other fishing gear lost from the harbour wall. This site is in a Marine Protected Area (2009). A permit is required. 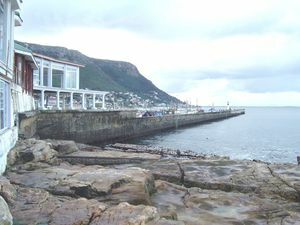 The site "Kalk Bay Harbour Wall" is off and near the harbour wall at the small commercial fishing harbour at Kalk Bay. Maximum depth is approximately 9 to 10m on the sand depending on the tide, and is not much shallower over the reef areas. Visibility is seldom better than 3m. Vertical faced concrete harbour breakwater wall with low profile rocky reef at the base, and patches of pebble and sand at about 8 to 9m depth, There are several concrete blocks and pieces of steel rail near the wall and other garbage including tangled fishing line, old lures, and usually quite a lot of sinkers. The reef extends to about 100m from the wall. Geology: Ordovician sandstone , probably of the Peninsula formation, or possibly the underlying Graafwater formation. Strike is about north-west/south-east, more or less perpendicular to the wall, and dip is quite shallow. about 5° to 10°, to the south west. A large swell will make exit tricky. If this appears to be too hazardous, it is possible to swim round into the harbour, where there are ladders and a beach, but this should be considered an emergency option, and the risk of injury by a boat is greatly increased. Keep as close to the wall as possible, and exercise due caution when surfacing. Boat crews will not normally be expecting divers in the water. If diving from the shore entry below the restaurant: There is a large gravel parking lot at the entrance to the harbour between the railway line and the harbour buildings: S34:07.780' E018:26.931', clearly visible in the aerial view. Turn left over the level crossing and then right into the parking area. The far end near the buildings is most convenient. If diving from the breakwater wall: Either arrange to park on the breakwater, which may require getting the chain unlocked, or park in the tarred lower parking lot and carry your kit along the wall. Public toilets are provided. They are usually open and may be clean. There is a restaurant and cafeteria in the harbour, well known for seafood. Entry and exit point at the end of the wall. The ladder can be seen about half way along. Normally done as a shore dive. Permission is required from the harbour master to dive from the wall, which is the usual arrangement for commercial diver training, as a feature of the site is the 3m jump entry and ladder exit. For this purpose parking may be arranged on the breakwater at the top of the ladder, which is about half way along the wall. It is recommended that a handrope be attached to a vehicle to aid divers climbing over the edge, as there are not very good handholds on top of the wall beyond the top of the ladder. Alternative access is from the shoreline rocks outside the harbour, which is in any case a far easier exit. This entry point is at the rocky shore at the end of the harbour wall just below the restaurant. A rock about 8m from the wall has convenient ledges for entry and exit at low tide. Wall moderately encrusted, no strong zonation. Reef fairly sparsely encrusted, largely encrusting corallines and urchins. Large shoals of juvenile fish in season, mainly Strepies and Blacktail, but also quite a few Hottentot. Anglers jig for Chokka (squid) from the wall at night. Macro photography is all that is worth trying at this site. Entry from the wall by jumping in (about 3m). Exit can be by the ladder on the wall, but it can be a tricky climb, particularly at the top, as the ladder stops slightly short of the top of the wall and the handholds are not abundant. Study the top of the ladder before entry to avoid embarrassment on exit. You may find it more convenient to use a rope to lift your equipment if you are not sufficiently fit and agile to climb a vertical ladder in full kit while holding your fins. Entry at rocks at start of wall: dive along base of wall, with occasional short excursions up wall and to side over reef until about half way along wall. Head out about square to wall along the top of the low reef until you reach the pebble zone, see if you can spot any Cerianthids, then continue to the edge of the sand and along this edge until it turns to the left. Then make your way across the reef more or less North magnetic until back at the wall close to the harbour mouth. Follow the wall back to the entry point, and exit. Monofilament fishing line. Some with complete with hook, sinker, bait and fisherman on the harbour wall. Nearby boat traffic. Possibility of Great white sharks in the area. This is a commecial fishing harbour but boats entering and leaving are usually on their way to or from fishing grounds, and do not usually spend any time in the diving area to the south east of the harbour. Recreational anglers commonly fish from the harbour wall and divers must keep a lookout for fishing lines. Sinkers and other fishing tackle are frequently found on the bottom. At night this is a popular squid-jigging site. No special skills are required. This is a popular training area for commercial and scientific divers. If you intend to go far from the wall a compass and SMB are recommended to help avoid the traffic zone at the harbour mouth, and to alert boats to your presence and position. This page was last edited on 18 July 2013, at 08:49.